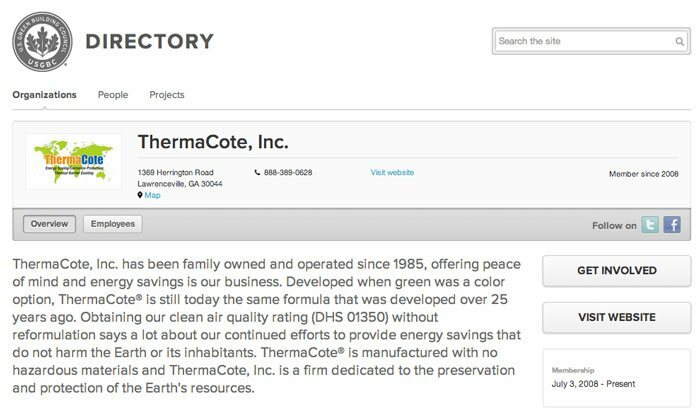 ThermaCote® is a high-performance ceramic insulating coating/weather barrier coating that offers superior corrosion protection for commercial, residential, exterior, and interior applications. 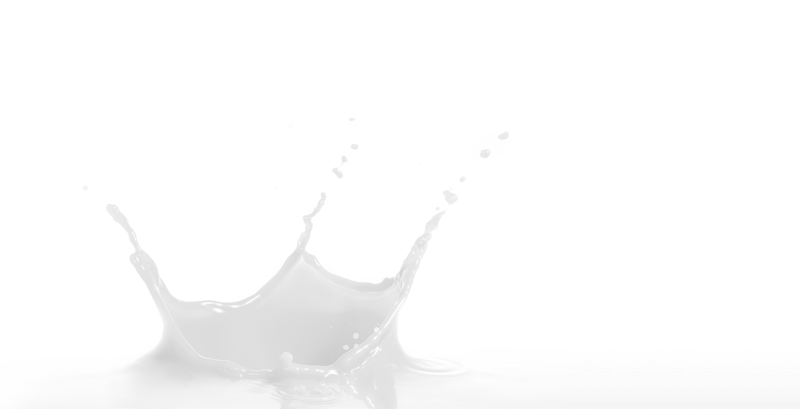 The advanced ceramic technology conserves energy, looks just like flat latex paint when dry, and has ultra-low VOCs at 5.3 G/L. 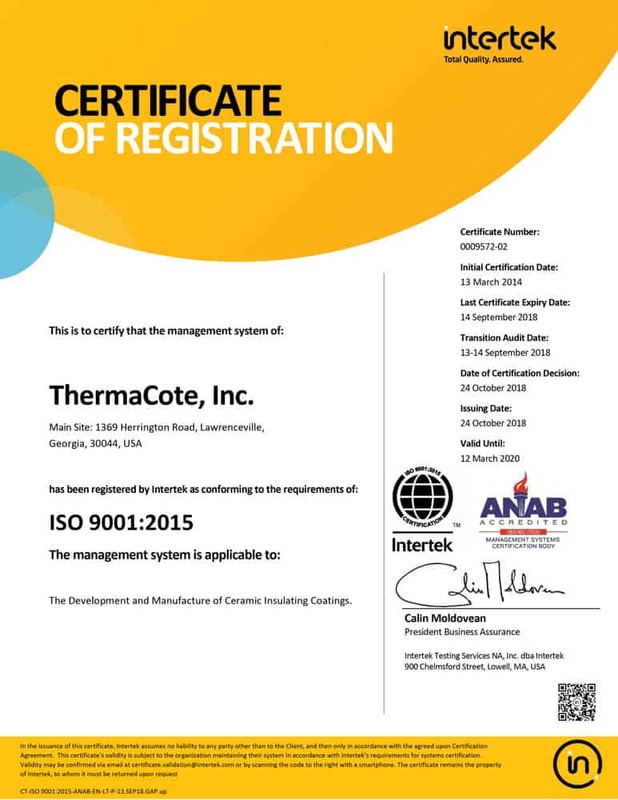 ThermaCote® is proud of the extensive certifications and accreditations that have been completed during our long history of product development and testing. 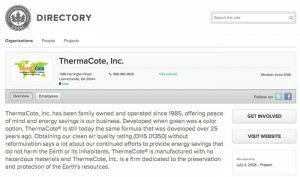 Our ongoing mission is to continue to enhance and perfect our weather barrier coatings and provide you with the highest quality products available. 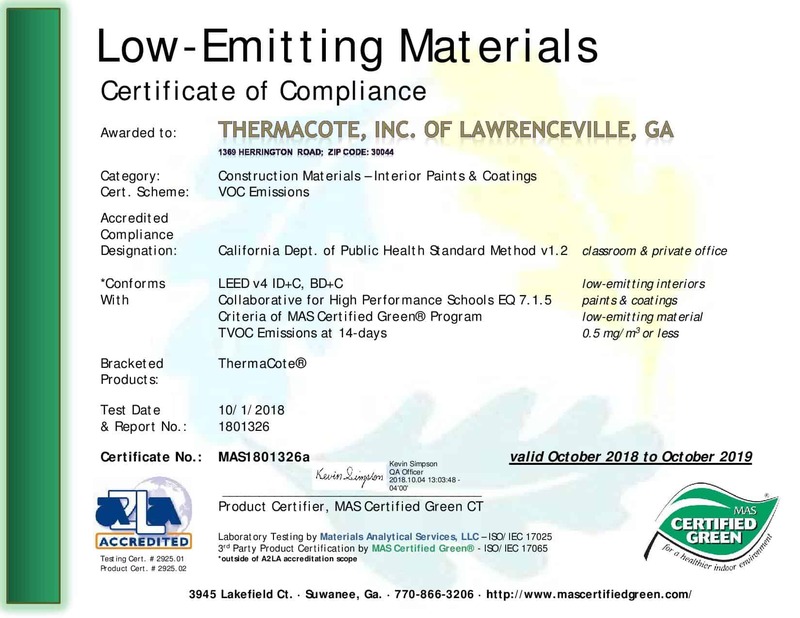 Materials Analytical Services, LLC provides independent emissions product testing and certification of a wide variety of residential and commercial building products through our nationally recognized MAS Certified Green™ emissions testing program, using small, intermediate and large test chambers. MAS scientists have worked closely with regulators and industry organizations to ensure that consumer’s indoor air quality concerns are addressed. Helping to meet the growing demand for “green building” products, MAS provides independent testing programs for IAQ validation. Only products that pass our stringent tests can display the MAS Certified Green logo. 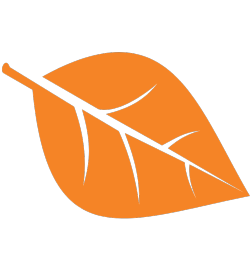 This logo is your assurance the product is certified for low VOC emissions. As a safety science company with more than a century of proven experience and expertise, UL is the premier resource for compliance validation, certification, testing, inspection auditing and knowledge solutions worldwide. 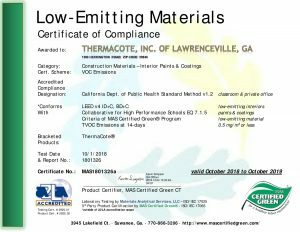 UL’s certification Mark is one of our greatest assets, and only those products that have earned UL certification are eligible to use our Marks. 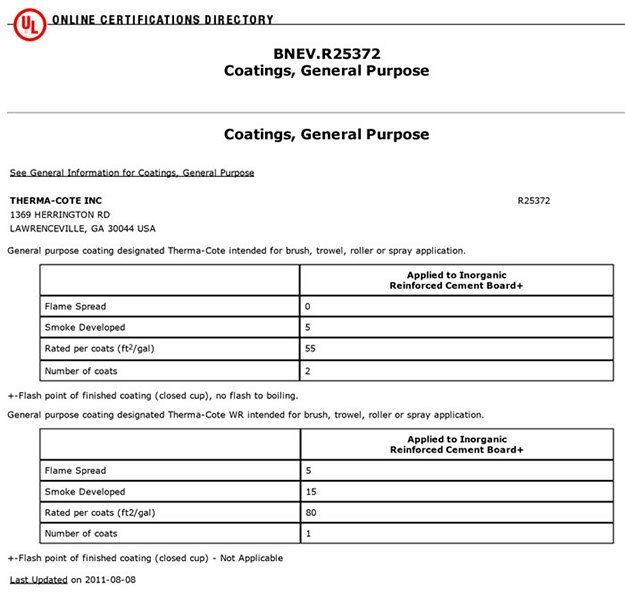 Only UL can issue our valued certifications and the Marks associated with them. A UL Classification Mark means that UL has certified a product for one or more of the following: (1) specific risk only, such as casualty, fire or shock; (2) performance under specified conditions; (3) compliance with regulatory codes; (4) compliance with other standards, including international or regional standards; or (5) other conditions UL may consider desirable. At the core of the CRRC is its Product Rating Program, in which roofing manufacturers can label various roof surface products with radiative property values rated under a strict program administered by the CRRC. 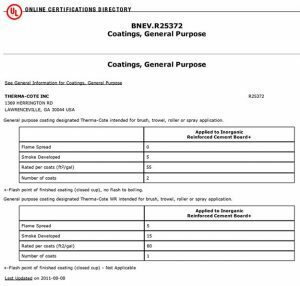 Code bodies, architects, building owners and specifiers can rely on the rating information provided in the CRRC Rated Products Directory. 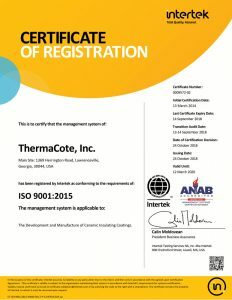 ThermaCote is a CRRC Rated Product, and our rating information can be found under the “CRRC Rated Product” logo. 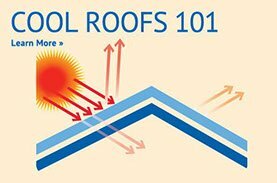 A cool roof is one that strongly reflects sunlight and also cools itself by efficiently emitting radiation to its surroundings. The roof literally stays cooler and reduces the amount of heat conducted to the building below. If a builder does not have air conditioning, this keeps the building cooler and a more constant temperature. If a building has air conditioning, the equipment does not have to work as hard. Imagine wearing a white or a black T-shirt on a hot day. By wearing the white T-shirt you will remain cooler than if you wore a black T-shirt because it reflects more sunlight and absorbs less heat. Cool roofs like a white T-shirt, keep the internal temperature of the building lower. However, a cool roof need not be white. There are many “cool color” products which use darker-colored pigments that are highly reflective in the near infrared (non-visible) portion of the solar spectrum. Because a white roof strongly reflects both visible and near infrared sunlight, a white roof will typically be cooler than a cool colored roof. 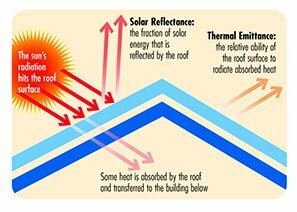 The two basic characteristics that determine the “coolness” of a roof are solar reflectance (SR) and thermal emittance (TE). Both properties are rated on a scale from 0 to 1, where 1 is the most reflective or emissive. 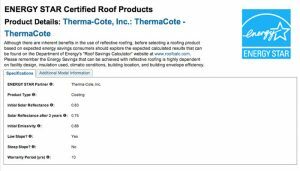 The CRRC measures these two properties for roofing products, both for the product’s initial values and after three years of outdoor exposure. The CRRC publishes the results on the online Rated Products Directory. Participation in the CRRC Product Rating Program is separate and distinct from CRRC Membership. 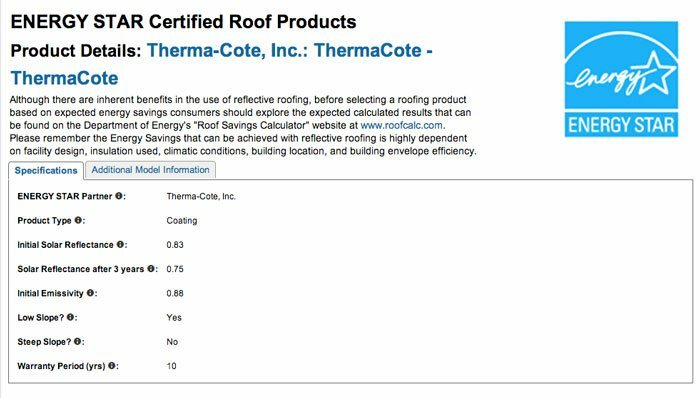 The CRRC administers a Rating Program in which companies can label roof surface products with radiative property values. The CRRC does not set a minimum definition for “cool”, the CRRC simply lists the measured radiative property values on our Directory. The ENERGY STAR program was established by EPA in 1992, under the authority of the Clean Air Act. In 2005, Congress enacted the Energy Policy Act. , which established at the Department of Energy and the Environmental Protection Agency a voluntary program to identify and promote energy–efficient products and buildings in order to reduce energy consumption, improve energy security, and reduce pollution through voluntary labeling of or other forms of communication about products and buildings that meet the highest energy efficiency standards. The U.S. Green Building Council (USGBC) and its community are changing the way buildings and communities are designed, built and operated. We believe in better buildings; places that complement our environment and enhance our communities. Places that give people better, brighter, healthier spaces to live, work and play. USGBC is a diverse group of builders and environmentalists, corporations and nonprofits, teachers and students, lawmakers and citizens that share the same vision of a sustainable built environment for all within the next generation. Today we are 76 chapters, 12,800 member organizations and 193,000 LEED professionals strong. 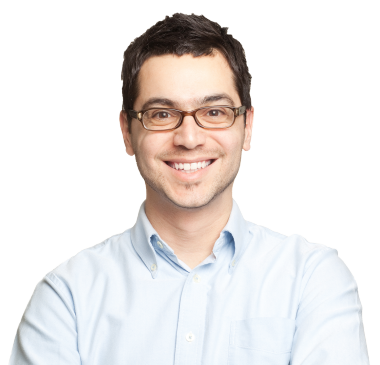 Founded in 2008 in Atlanta, Georgia, the Green Chamber of the South supports the growth and success of sustainable business and encourages innovation and adoption of clean technology. We are a non-profit organization working to make the Southeast the center of sustainable business in the United States. The Green Chamber of the South is dedicated to one core purpose: to bring together businesses and organizations across the Southeast to promote the growth, innovation and success of sustainability. The Green Chamber connects sustainable businesses, clean technology companies, corporations with sustainability programs, nonprofits and government organizations throughout the Southeast so that they may create enduring business connections, share best green practices, learn from one another and grow both their own bottom lines as well as create new green jobs. 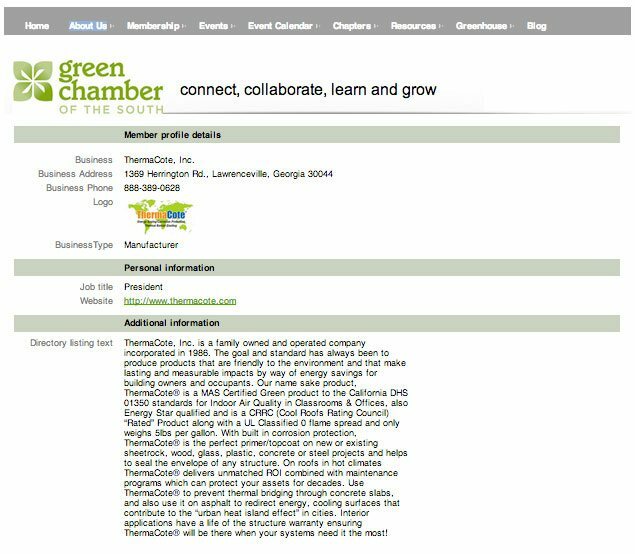 The Green Chamber of the South offers businesses exposure, networking opportunities, collaborative projects, workshops, roundtables, mixers and seminars as well as a Greenhouse Accelerator that helps startups with networking, services and funding. 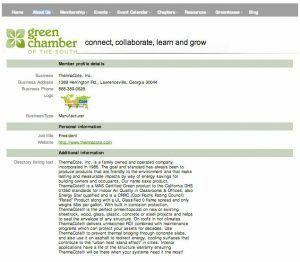 The Green Chamber of the South provides sustainable business in the Southeast with a strong organization, guidance and ample opportunities for collaboration and growth. For more than 130 years, Intertek has ensured the quality and safety of products, processes, and systems. They go beyond testing, inspecting and certifying products; they help customers improve performance, gain efficiencies in manufacturing and logistics, overcome market constraints, and reduce risk. Intertek’s services help minimize the adverse health and environmental impact of products and processes for the benefit of society as a whole. Intertek is the industry leader with over 36,000 people in 1,000 locations in over 100 countries. 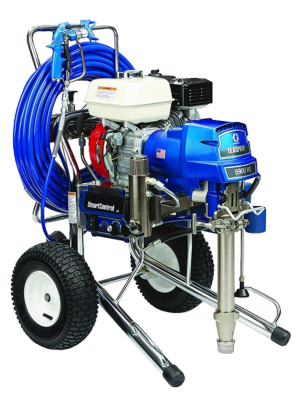 Whether a business is local or global, Intertek can ensure a product meet quality, health, environmental, safety, and social accountability standards for virtually any market around the world. They hold extensive global accreditations, recognitions, and agreements, and their knowledge of and expertise in overcoming regulatory, market, and supply chain hurdles is unrivaled. 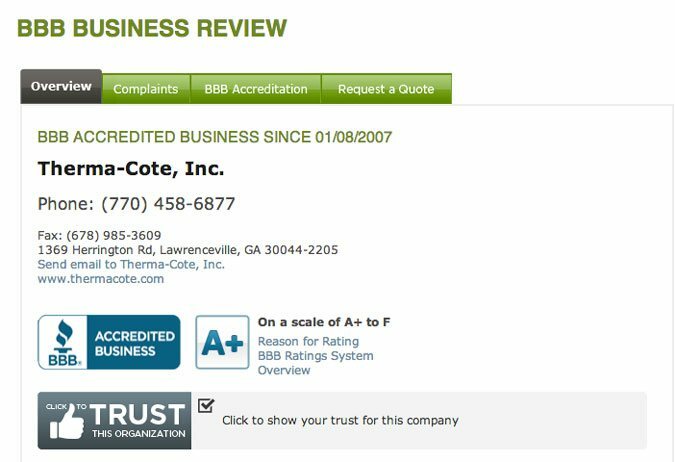 BBB helps people find and recommend businesses, brands, and charities they can trust. For over 100 years, BBB has helped people make smarter decisions and is evolving to meet fast changing marketplace needs. BBB sets standards for ethical business behavior and monitors compliance. Almost 400,000 Accredited Businesses meet and commit to our high standards. 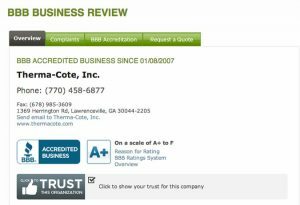 BBB helps consumers identify trustworthy businesses, and those that aren’t, through more than 4 million BBB Business Reviews. BBB sets standards for and evaluates thousands of advertisements each year to ensure that people can trust what advertisers say. BBB sets standards for and evaluates the practices of thousands of charities so that donors know where their money is going.